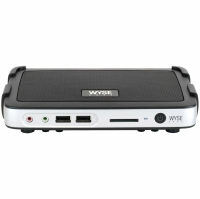 Dell Wyse T10 Thin Client - A great value from day one. The Dell Wyse T10 sets the new standard for affordable thin clients. Providing an exceptional user experience, the T10 features incredibly fast Wyse ThinOS, for environments in which security is critical-there's no attack surface to put your data at risk. Empower your team with enterprise-class thin clients on an entry-level budget. 3000 series thin clients feature a wealth of premium Wyse cloud client features, and unlike traditional budget clients, the 3010-T10 is ready to connect to almost any environment, including web-based applications and services. The Dell Wyse 3010-T10 thin clients can quickly process virtually any daily task with the powerful single core Marvell ARMADA PXA 1.0 GHz SoC. A built-in hardware media processor helps deliver smooth imagery, bi-directional audio and flash playback performance. Questions about the Dell Wyse 3010-T10? We can help. For more information about the Dell Wyse 3010-T10, or any of our products and services, call us at 1.800.457.8499 or email us. Order your Dell Wyse 3010-T10 today. Order your Dell Wyse 3010-T10 now. Your purchase order, with credit approval, is welcome, as well as all major credit cards, PayPal and Google Checkout. Remember, you'll get FREE technical service with every product you buy from Vecmar.